Summer’s big celebration in America is July 4th. It’s a given that there will be parades, fireworks, grilling, BBQs, and lots and lots and lots of red, white and blue. Almost like other big ‘decor’ holidays, like Christmas and Halloween, communities, towns and cities start showing signs of 4th of July celebration days and weeks ahead of that big day! 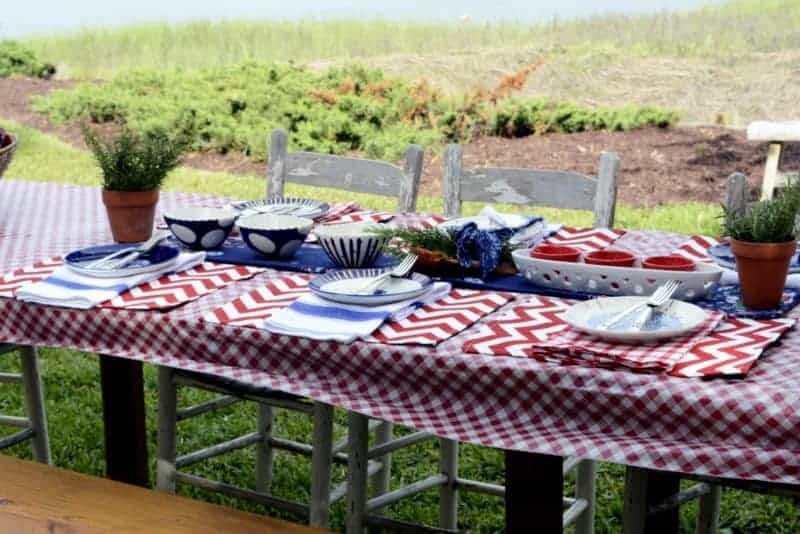 And, these five patriotic dining table designs boho style should get you right in the mood for decking out your table. Or tables! No one’s more patriotic than our family. And, we love to strut our colors symbolic of our country’s soiree on Independence Day. True to my bohemian style, my twist and flair for the red, white and blue has the chic hippie, gypsy, boho flavors and feel. 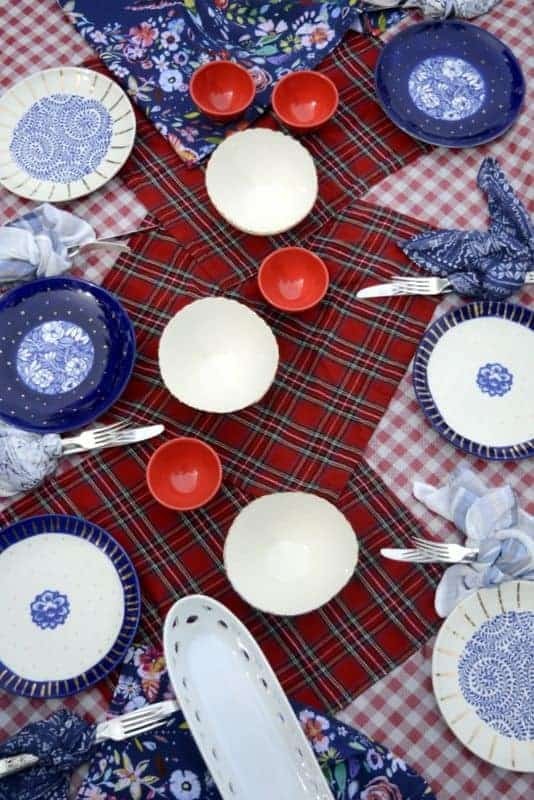 Interspersed on these eclectic tables you’ll find not only red, white and blue but the colors of the rainbow, an array of hues, that defines our melting pot of great American people. I’ve started with the basics. My plates, bowls, serving pieces, and silverware. 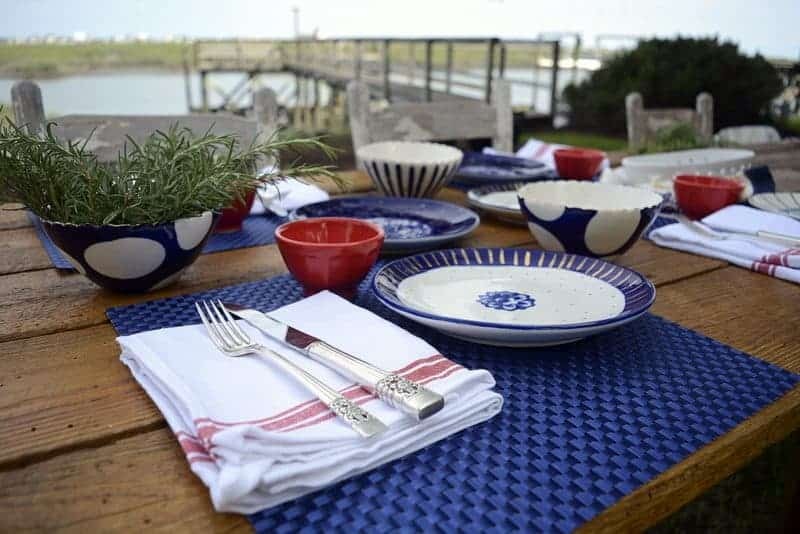 The dishes in cobalt blue serve as the anchor for each table design. It’s important when you’re shopping for things like this to think before you buy. Ask yourself, ‘How many different ways can I use this item? Can it be adapted for something other than the ‘x’ occasion for which I’m buying it?’ Yep, it’s getting more mileage out of your investment! 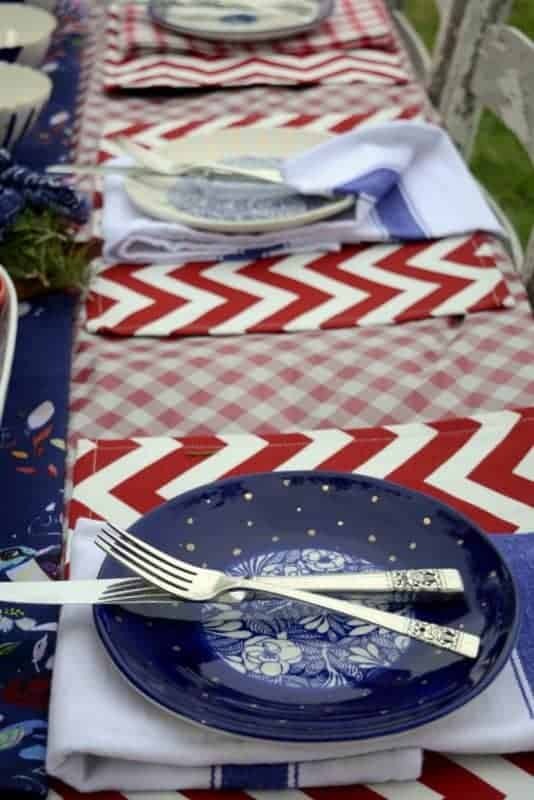 So, instead of buying those dishes with a huge American flag on them, get something more ‘neutral’, say a solid color, and create the July 4th feel with other accessories. 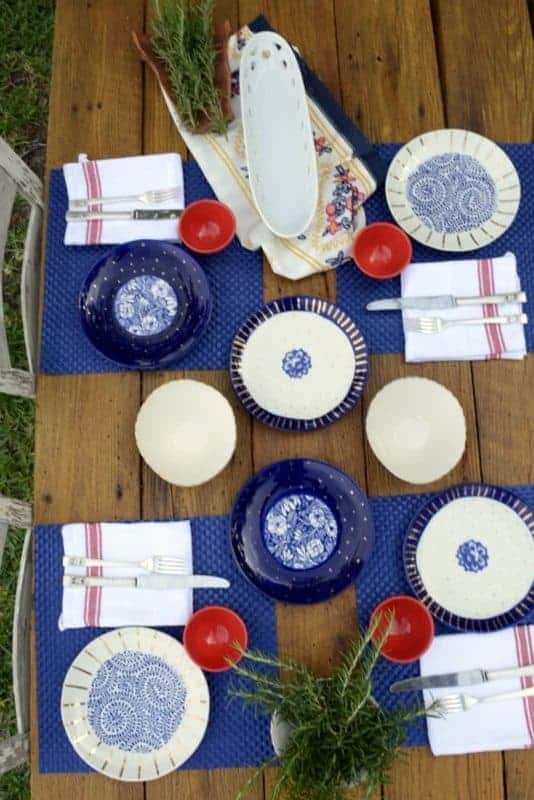 You’ll see from the photos, I’ve simply rearranged and changed up a few things on each table, place mats, napkins, tea towels and other accessories (mostly from my yard), making entirely new looks. The dishes are all the same. All of my ‘stuff’ comes from ‘wherever’. It doesn’t need to be pricey. I got the checked table cloth, plastic, at the dollar store. One buck. And, this a lot of this ‘stuff’ are things that I use year-round, not just for the 4th of July. 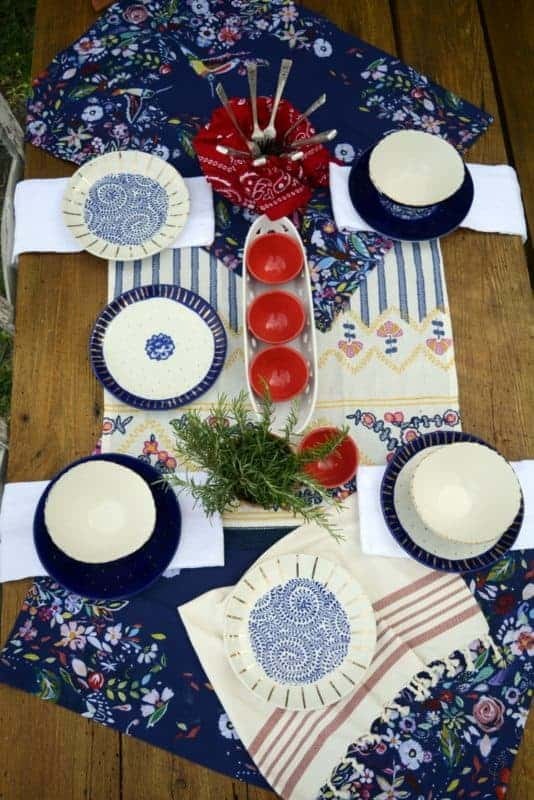 For example, I may use the red zigzag placemats at Christmas or on Memorial Day. The colorful tea towels can also double as drying towels in my kitchen. If I’m using them on the table, I’ll give them a quick once over with the iron to gussy them up a bit. Bandannas are awesome for your table decor, and they’re totally inexpensive at about a buck each at somewhere like WalMart. They come in so many designs and colors. 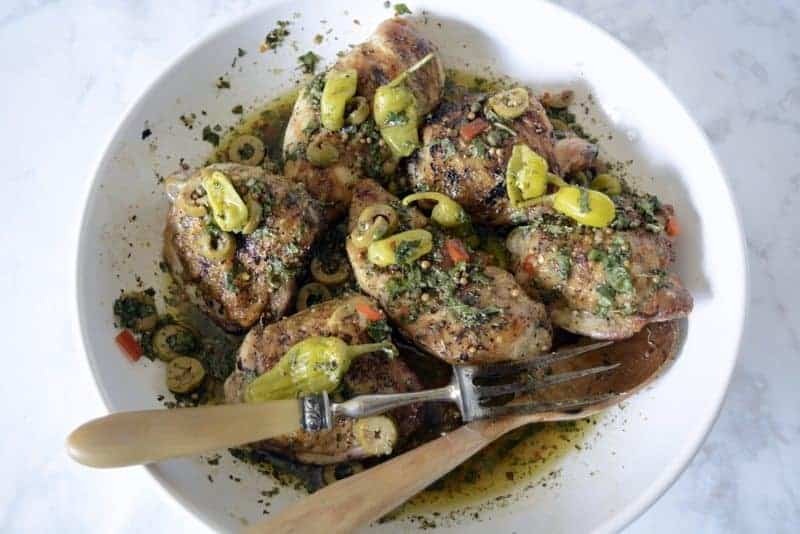 You can use them for napkins, in bread baskets, as a liner in a small clay pot (as you’ll see in this post) where silverware is placed. So stinkin’ versatile! 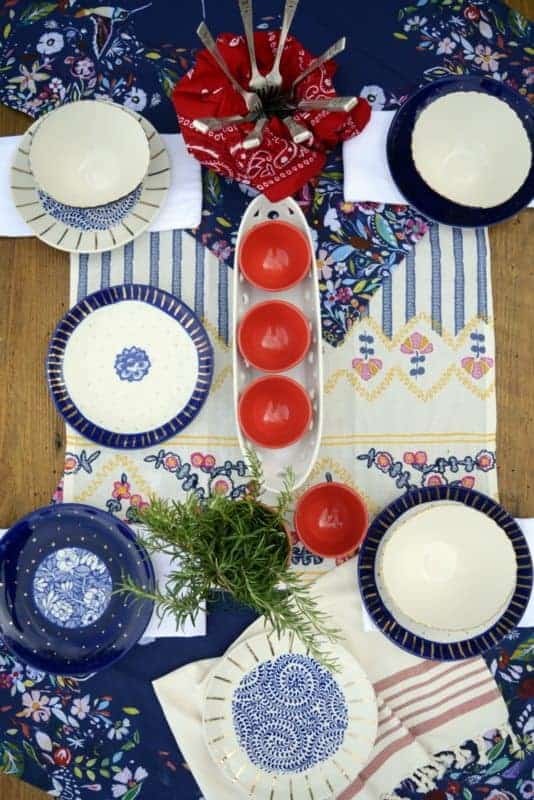 This look gets its red, white and blue from the plates and from the food. 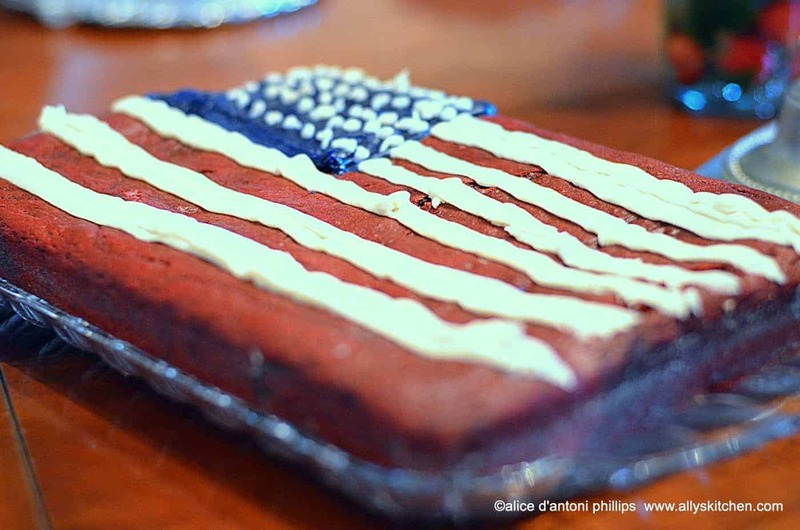 Don’t forget that the food can scream patriotic, too! Really soft pliable scarves can become great napkins. I love wrapping and tying them around the silverware. No different than when I wrap and tie them around my head! And, yes, they’re washed and cleaned, so don’t fret! You might get a tad bit dizzy with this table decor, but have another sip of wine and all will be good. The plastic cheapy checked table cloth isn’t even that noticeable with the placemats on it. Found these at a close out sale for about a buck each. At the time, I had no idea how I’d use them. It was just a deal too good to pass up. You’ll see that the napkins are dish towels, blue stripe and the checkered one. The ‘runner’ is simply two colorful dish towels folded, overlapped a little and placed in the middle of the table. A piece of broken pottery and some fresh rosemary tied with one of my hair bandanas. There you go, Independence Day happening! With this table, I wanted to focus on the plaid. Overlap them for more interest. These are Christmas napkins I got several years ago at Home Goods and have loved. I knew when I saw them that they’d work for lots of tables from formal and Christmas to a cowboy cookout. 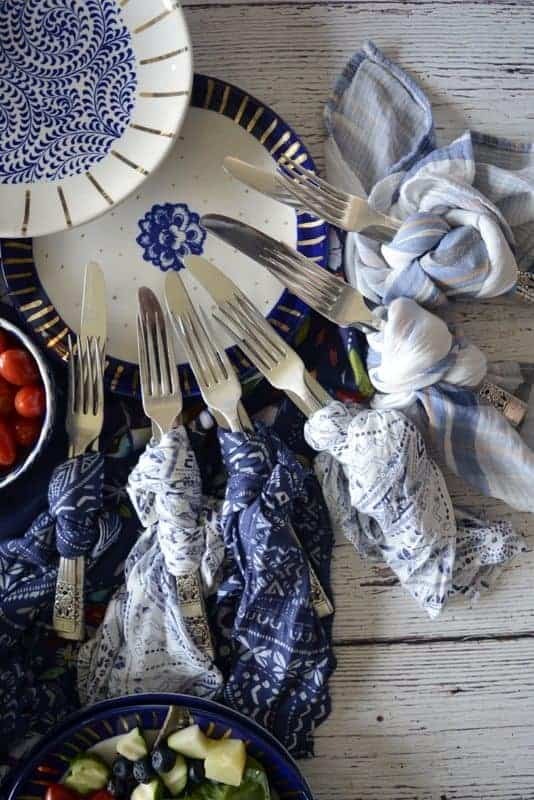 The utensils are tied in my boho scarves. Yep, I can wash these and wear them! 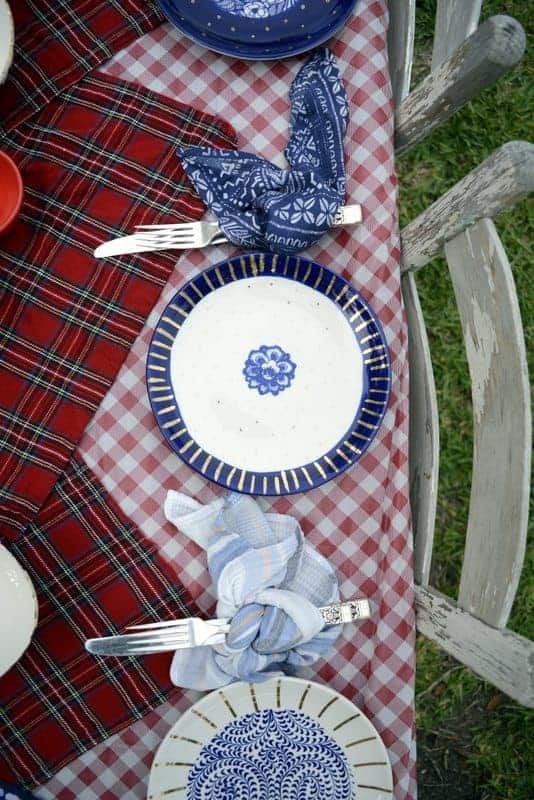 On the ends of the table, I’ve placed two identical colorful tea towels where the food will be placed. And, that one buck tablecloth from Dollar Store, plastic perfection! This table has elements of the other designs, but I’ve lost the checked tablecloth and am focusing on the wood grain of the table. Then there’s a centerpiece contrasting tea towel that defines the ‘center’ of the table. The utensils are in a small clay flower pot lined with a red bandana. Fan the knives and forks out for more flair! You’ll also notice that the napkins are under the plates. And, these are flour sack towels. Super cheap. You can buy them in packs of four at big box stores. They’re large and great for keeping faces and hands clean! Just wash with some bleach and use them as your dish towels, too. This table decor lets the beautiful barnwood table shine, too. 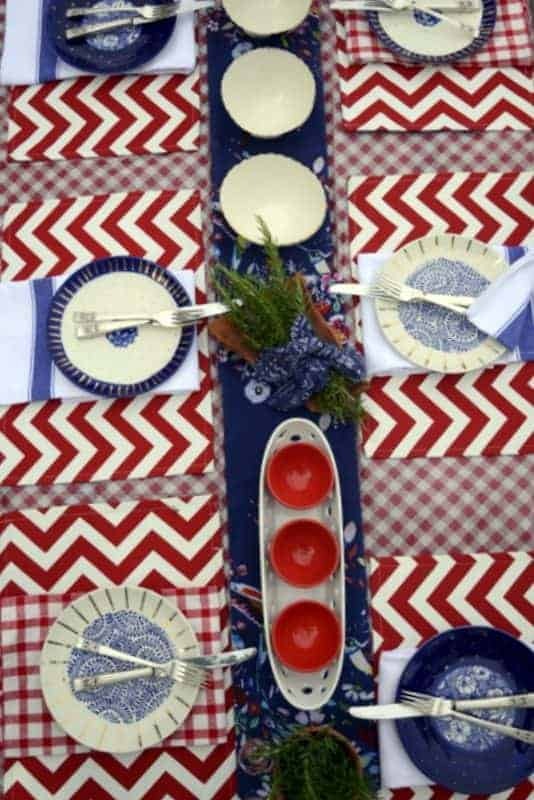 With the cobalt blue plastic mats that can be found at stores like TJMaxx, Marshalls, Target and Home Goods, there’s a pop of patriotism. Napkins are dish towels with a single red stripe and accents of red can be found in small serving bowls. That broken piece of pottery serves as the ‘vase’ for rosemary while more rosemary is in a blue polka dot bowl. 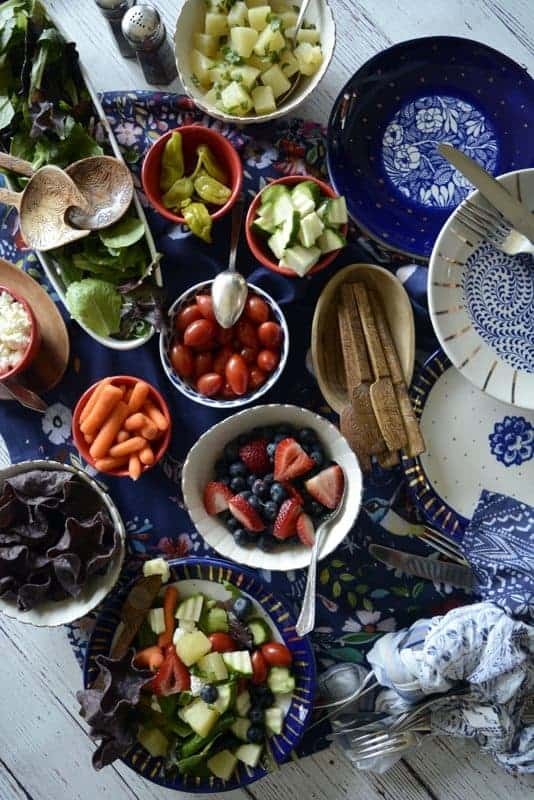 A boho design tea towel rounds out this table.